The delivery of an entire roll shop including equipment for a new hot rolling and a skin pass mill in Mexico. The scope of delivery includes four roll grinders, the Roll Shop Management System RSMS and comprehensive equipment for roll storage, machining, assembly, and transport. “Receiving this order is a clear signal that quality prevails in the end even in a highly competitive market environment,” says Christoph Thoma, CEO of Herkules. With this new plant to be installed by Primetals Technologies, ArcelorMittal México expands its production site at Ciudad Lázaro Cárdenas. The hot rolling mill – consisting of a roughing mill and a seven-stand finishing mill – will produce 2.5 million tons of hot strip per year; the skin pass mill is designed for an annual capacity of 650,000 tons. Three roll grinders of the type WS 450 Monolith™ for the machining of work rolls of the finishing and skin pass mill and a WS 600 Monolith™ for all rolls in the hot rolling mill will form the key components of the new roll shop. The highlight of the machines: the unique combination of Monolith™ technology with ultra-fast control and measuring systems specifically developed for grinding applications. Both the rolling mill manufacturer Primetals Technologies and the steel producer ArcelorMittal will benefit from the excellent damping characteristics, thermostability, the reduction of foundation costs and correction grinding on the fly. 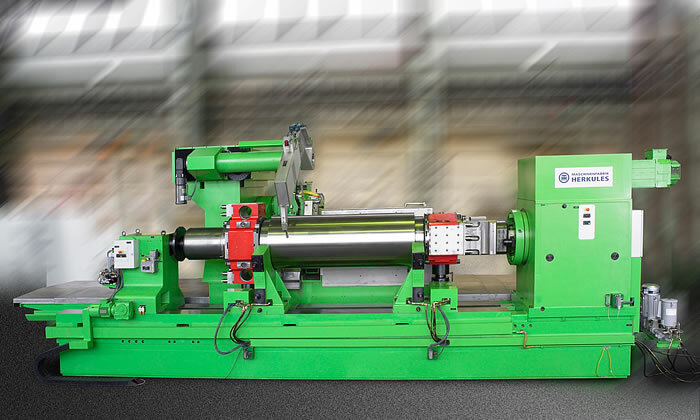 In addition to the four roll grinders, Herkules also provides the equipment required for fast and secure flow of the rolls and chocks in the roll shop. This includes roll transfer cars, de-chockers for chocks of work and back-up rolls, a chock tilter, roll cooling stands and racks. The decision fell on Herkules due to the convincing quality and technology of its products. The manufacturing and supply of all components including automation have been laid into experienced hands in order to meet the high requirements in the roll shop.